A combination of sweet and nutty, juicy and crunchy, these muffins are great for breakfast or an anytime snack; they're soooo good; and they're super easy to make. In fact, most of the prep time comes from chopping the pears and toasting the walnuts. The recipe suggested doing an oven toast, but I prefer the stovetop method in a dry skillet over low heat. For the pears (I used D'Anjou), I only needed about one and a half although they seemed about average size. 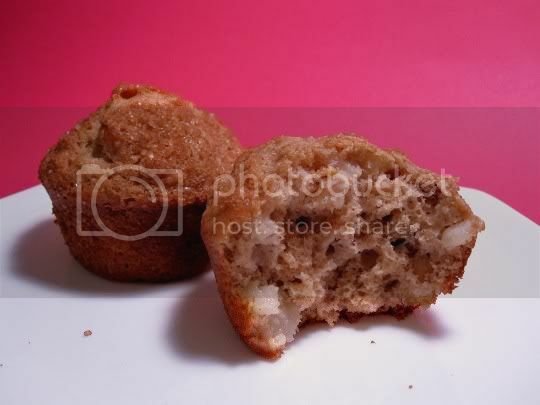 Whole wheat flour is used in the batter (in addition to regular white flour), giving the muffins a hearty yet fluffy texture and earthy flavor. This paired with the wonderful taste of fragrant, roasted walnuts--yet contrasted with the sweet, light, juicy pears--makes these some of the best muffins I've tasted in a while. Even the texture contrasts are great: crunchy walnuts, soft and delicate pears, and to top it off, the great mapley crunch of turbinado sugar. The recipe suggested using "regular" sugar to sprinkle on before baking, but I just knew the turbinado would really turn these up! Sure enough, I was right! Make again? Definitely. Apples would probably work well here, too.